If there's one thing I'm not, it's afraid to put holes in my walls. I know a lot of people who find hanging a picture terrifying because you're putting a hole in the wall. You know, damaging your house!? But I wonder... would those people be less afraid if they knew how easy it was to fix? Since I'm moving out of my apartment and had hundreds (yes hundreds) of holes to patch, I thought I would show you how I tackled them all and was done in just a few hours. 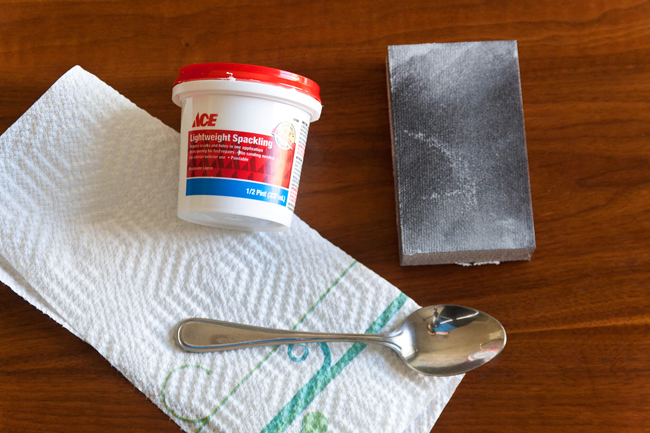 "lightweight" stuff from Ace Hardware and it was super super nice, especially for the small nail holes), sand paper (I used a sanding block because it's easier to hold and makes for a smoother surface), paper towels, and a spoon. 1. Clean Your Hole: First of all ew, I'm sorry. 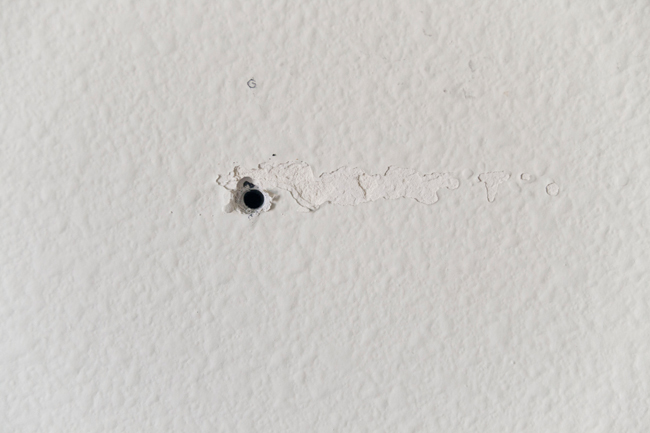 ANYways... Often, when you pull a nail or screw out of the wall the drywall/paint will pucker out around it. For example, take the large screw hole I photographed below (this was the gnarliest patch job I had to do in the apartment, so I thought it would make a great example). Since any raised area like that will be super noticeable after the hole was repaired, it needed to be smoothed out. Using the round bottom of my spoon, I pressed the drywall flat again. Some people use a hammer or sand paper for this part of the job, but I've always found a spoon gets it done with the least trouble/mess. 2. Apply The Spackling: Many people use a putty knife for this step, but I just use my finger. If you have completely flat walls, a spatula works best, but my walls are textured. My finger always does a better job of getting in the nooks and crannies. Always start by over-applying like the image below. 3. 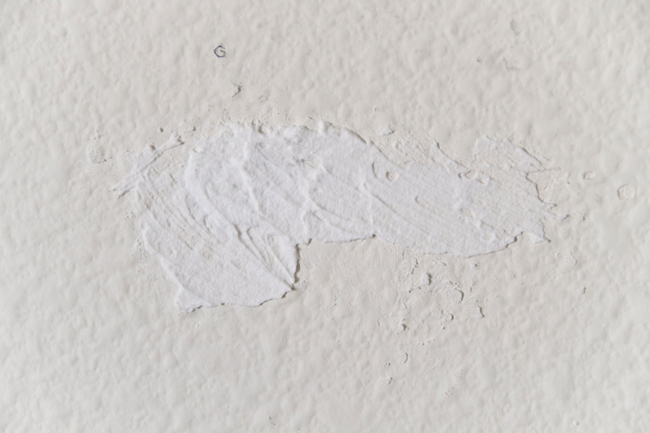 Wipe It Down: You could leave all of that excess spackling then sand it off once it dries, BUT you are making your job harder and will probably sand off your wall texture to too (making for an oddly blank spot on your repaired wall). 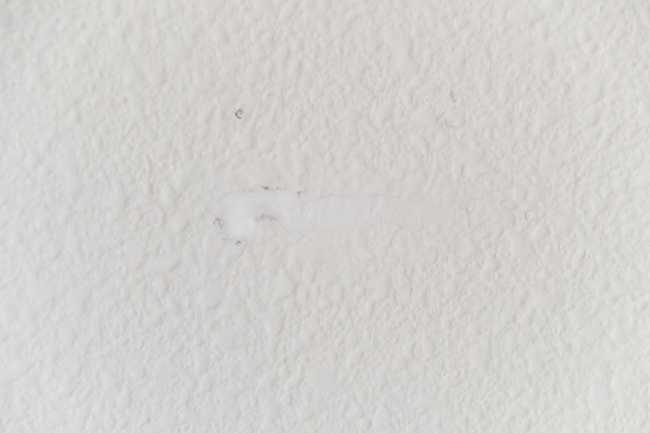 Wipe off that excess before the spackling dries - you can always add more later if your hole is too big to fix with just one coat. 4. Add More Spackling as Necessary: Since this hole was big-ish, I needed to add a second layer of spackling. Wait until your first layer is completely dry (trust me - it wont work if you cheat the drying time, just give it a half hour or so), then repeat steps 2 and 3. 5. Extra Optional Steps: Usually my repair jobs are good to go at this point, but... if your patch is still lumpy sand just a little to even things out. Don't over sand or you will rub your wall texture right off... if your patch is too smooth and looks like a bald spot on the wall, you can add texture to your walls with spray texture from your local hardware store... 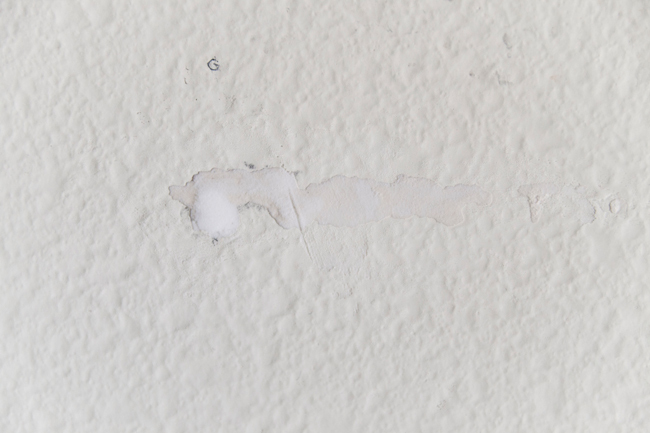 If your spackling doesn't match your wall color, use spare paint to totally mask the hole. I always try to keep around a small sample container of each of my paint colors for just such an occasion. There's a slight possibility that all of this might seem more complicated than it is because I over explained the process. I do that. It's a bad habit. But I just wanted to make sure you had all the info you might need. Most of the time, it's really as easy as dabbing a little spackling with one finger and wiping it off with another finger. It takes 3 seconds. Promise. Don't fear the holes!